Every year, in the lead-up to the Academy Awards, the FIDM Museum puts together a wonderful exhibit of some of the year’s best in costume design. 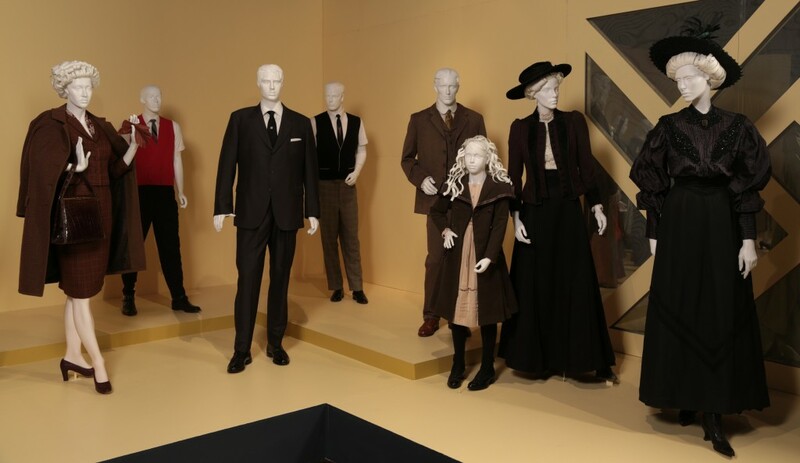 I had the great opportunity to attend the opening of the 22nd Annual Art of Motion Picture Costume Design Exhibition this past weekend, and I highly recommend it. 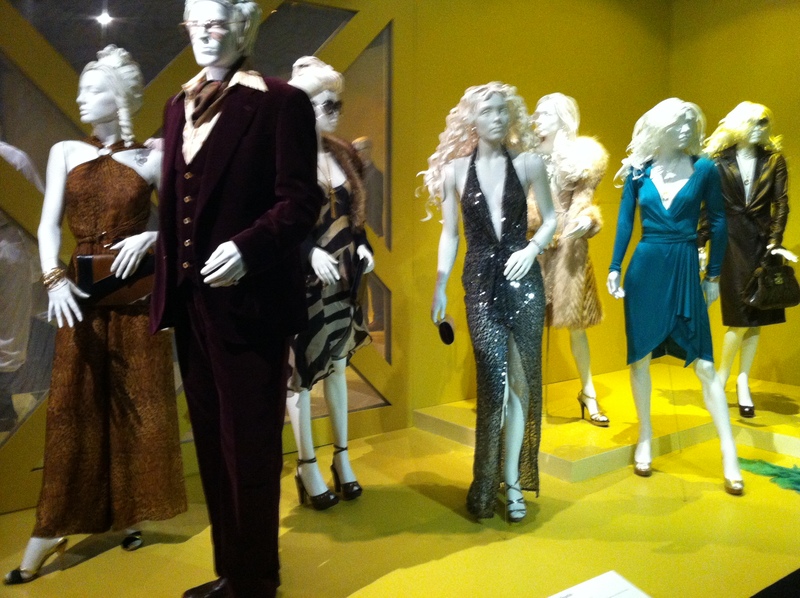 On display are costumes from more than 20 films from the past year, and they are a stunning tribute to the hard work of some very talented designers. All five of this year’s Oscar nominees are featured, as well as last year’s winner, Jacqueline Duran, for Anna Karenina. It really was fascinating to see these costumes up close. There was so much texture involved, and you can clearly tell that the costumes allow for movement while looking futuristic and otherworldly. 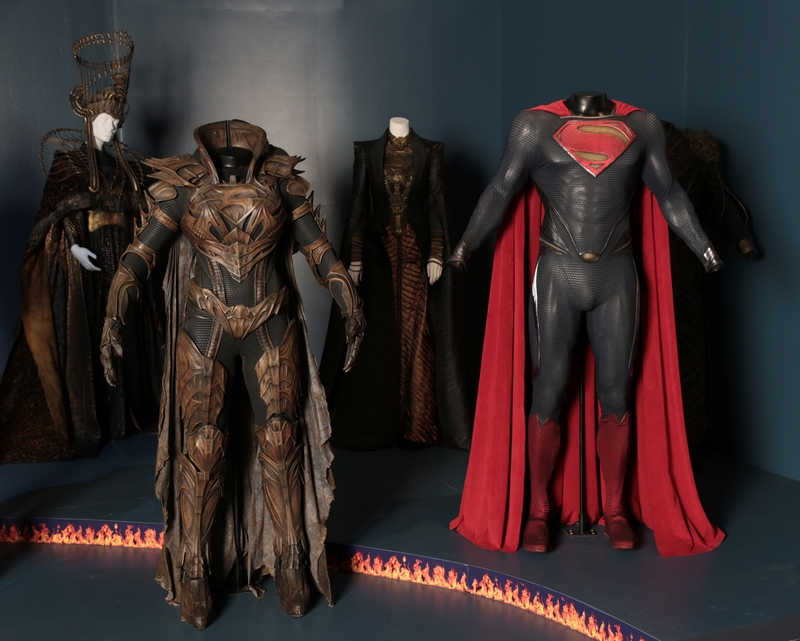 One of the highlights of the exhibit is the updated Superman suit from Man of Steel, designed by James Acheson and Michael Wilkinson. 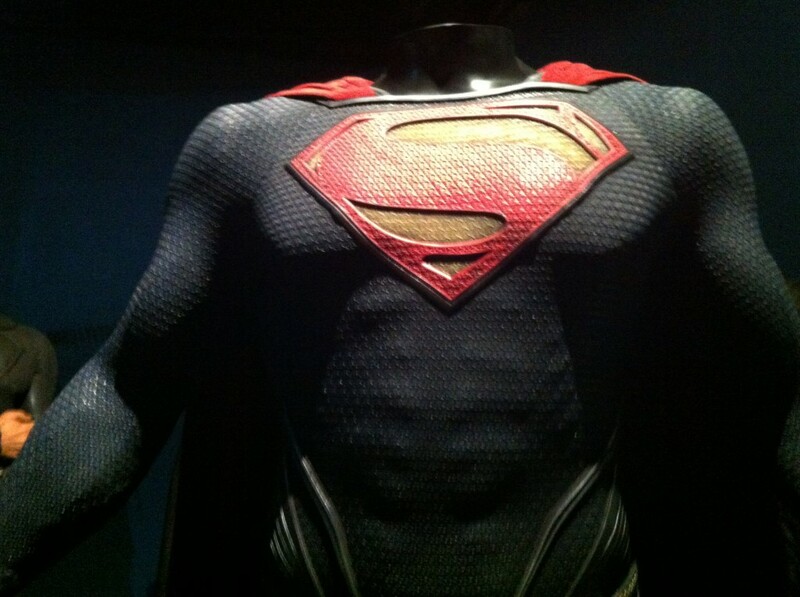 It still has the traditional cape made of rich red fabric, but the suit itself has a structure molded to actor Henry Cavill’s body shape, and a fluid, honeycomb-inspired texture. It is a wonderful blend of the classic look with a modern sensibility. 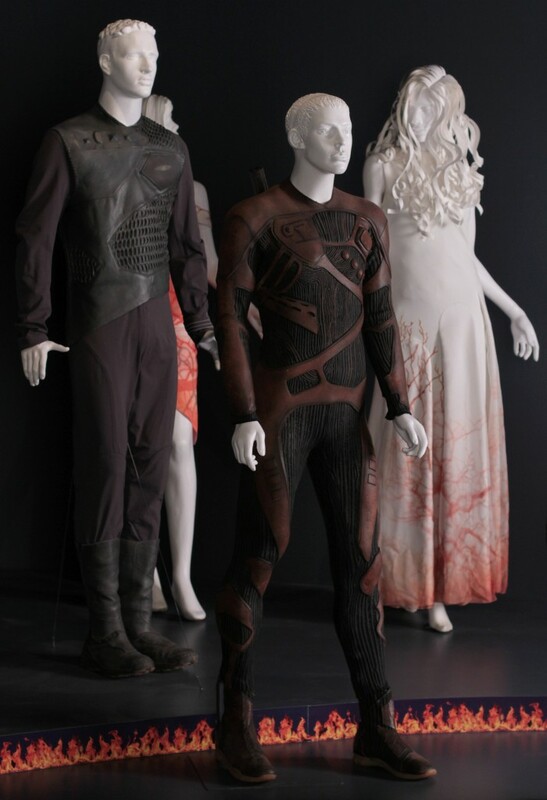 The materials used by designer Amy Westcott for After Earth were also very unique. The men’s suits had an almost rubber-like look, molded in interesting patterns that looked both functional and stylized. The women’s dresses on display had a beautiful red and white ombre pattern. Michael Kaplan’s designs for Star Trek Into Darkness followed this same blend of style, texture, and function. Leonard Nimoy’s etched-pattern ensemble had a heavy weight, but still draped attractively. Benedict Cumberbatch’s leather jacket had a highly structured collar, with pleats that made it look simultaneously earthy and otherworldly. 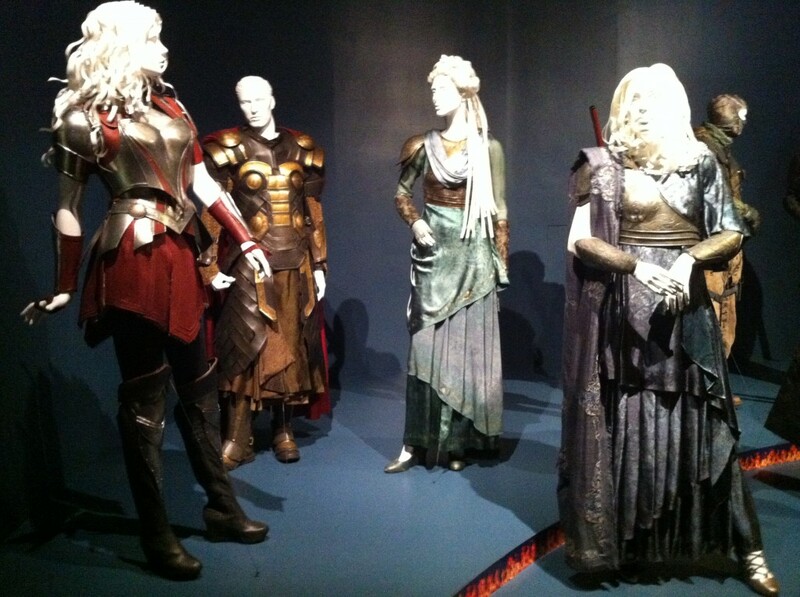 Also on display were costumes from Thor: The Dark World (designed by Wendy Partridge). 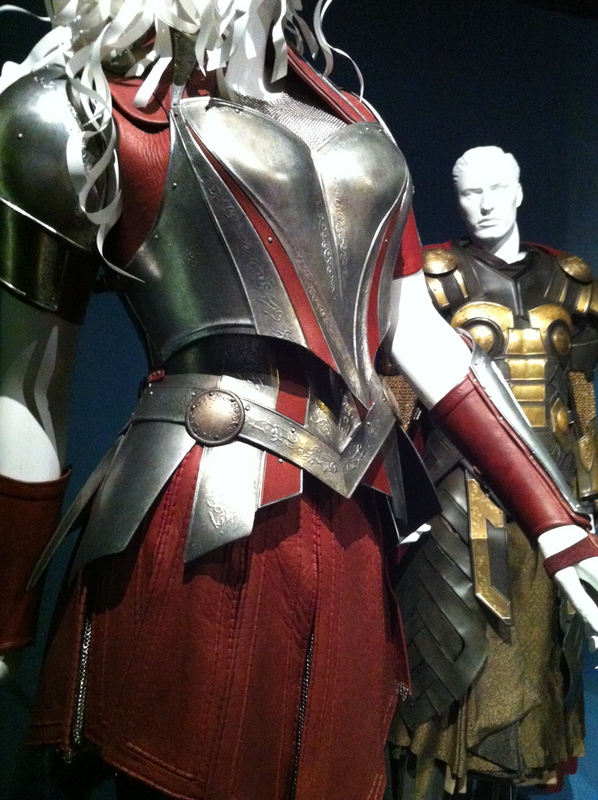 These combined armor with elements of ancient Greek and Roman fashion. The women’s dresses were layered and draped beautifully. One of the highlights of seeing these costumes up close was the detail. 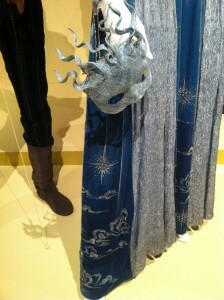 The fabrics had an almost watercolor effect to them, with many subtle patterns. The armor on Jaimie Alexander’s costume had small patterns stamped around the edges, giving it an interesting depth. 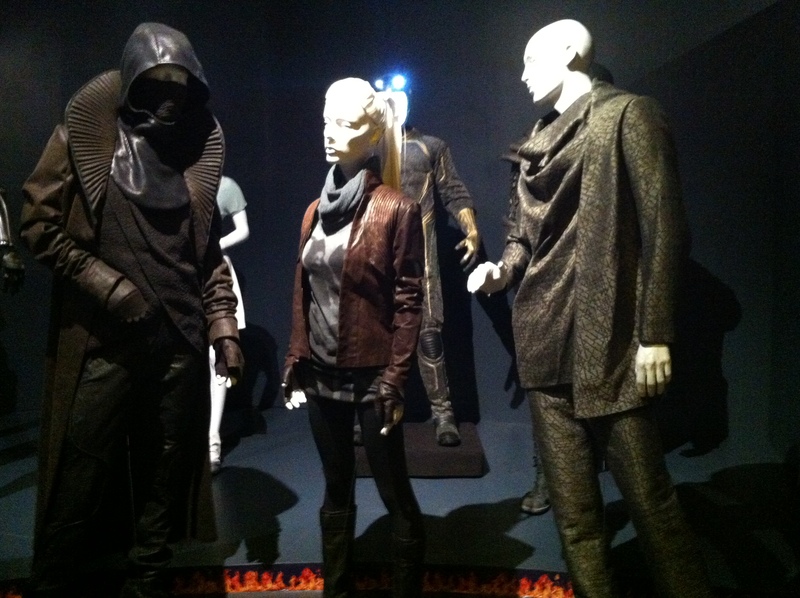 The exhibit rather seamlessly transitions from the sci-fi into more traditional design realms with costumes from fantasy films Hansel & Gretel: Witch Hunters and The Hunger Games: Catching Fire. 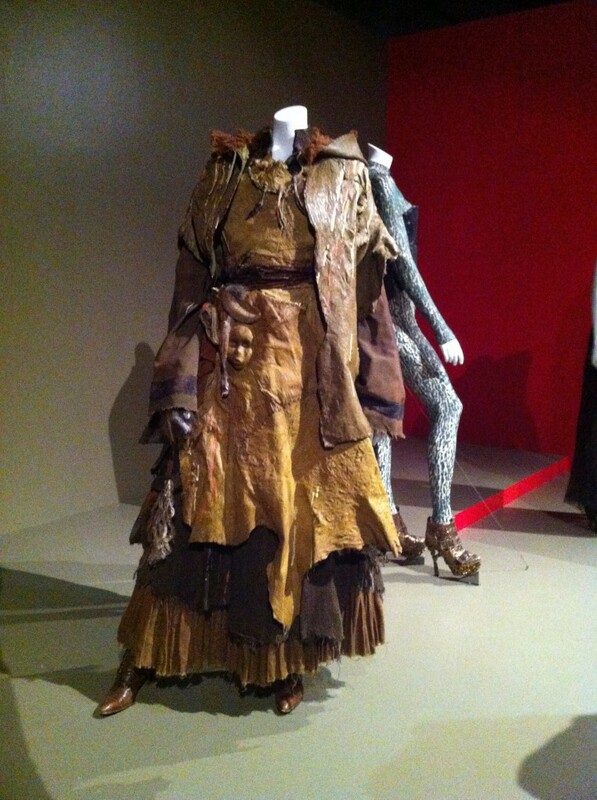 Marlene Stewart’s designs for Hansel & Gretel had so much interesting detail. I have not yet seen the film, so I’m not as familiar with the characters, but the costumes for the witches had amazing texture and fascinating accents like a collar made of ram horns and a small, childlike face mask on a belt. 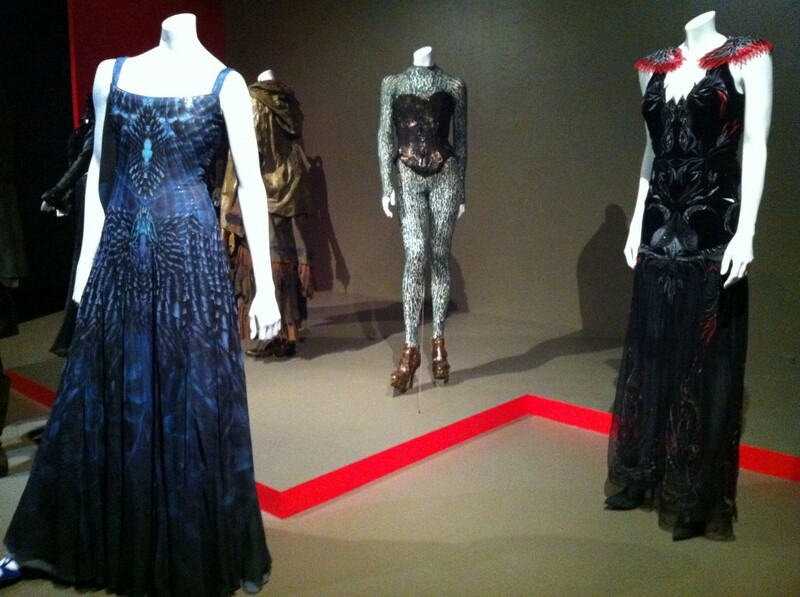 It was wonderful to see Trish Summerville’s Hunger Games costumes up close as well. On display was an ensemble for Jena Malone’s character that did not get a lot of screen time in the film, but was so interestingly made. 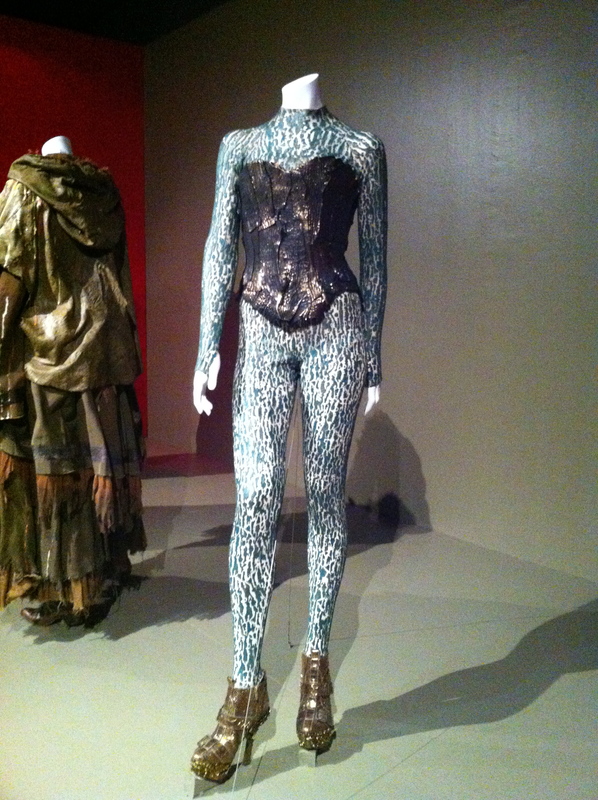 A bronze corset layers over a full bodysuit texturally painted to look like the bark of a tree. I also loved the feather detailing on Katniss’ party gown, and the custom-painted blue fabric of her iconic Mockingjay dress had so much more detail than even shows up on the screen. 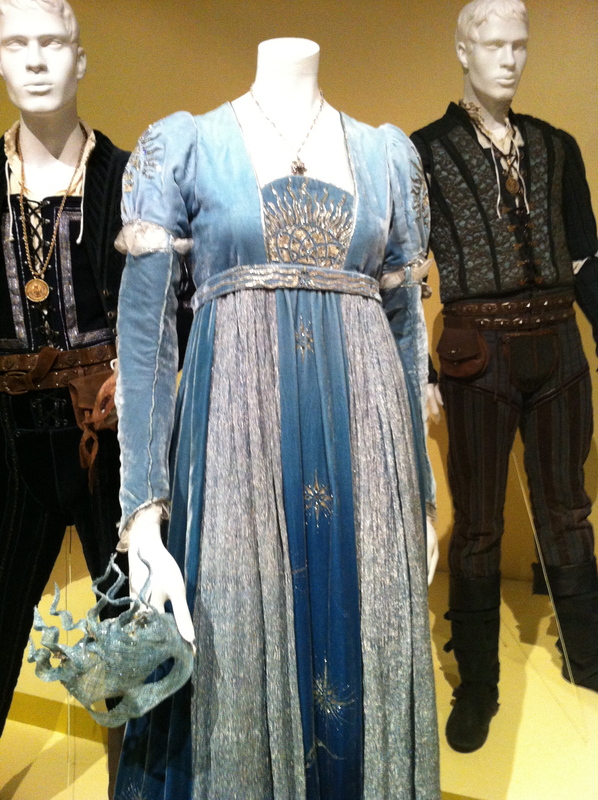 I was very impressed with the surprising detail on the costumes from the most recent adaptation of Romeo & Juliet. Carlo Poggioli’s designs included a beautiful blue gown with a glittering celestial pattern, and a beautifully made, delicate mask to match. 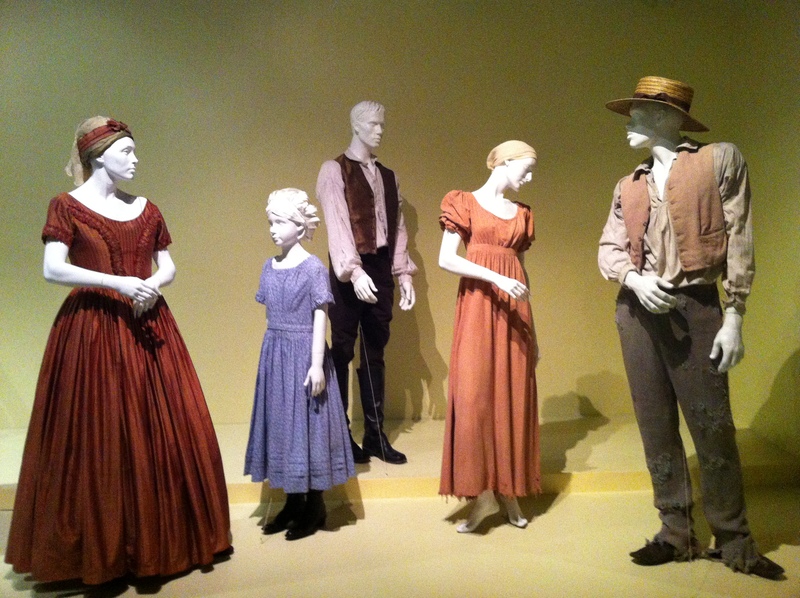 On the opposite end of the spectrum, the Oscar-nominated costumes from 12 Years a Slave were equally as detailed in their simplicity. Patricia Norris created a neutral color palette, and had to do a great deal of aging and distressing for some of the costumes. Chiwetel Ejiofor’s pants were torn and patched, and it was interesting to see up close the way they were not just ripped, but also looked as if some of the tears had been re-sewn to give the effect of darning and repair. 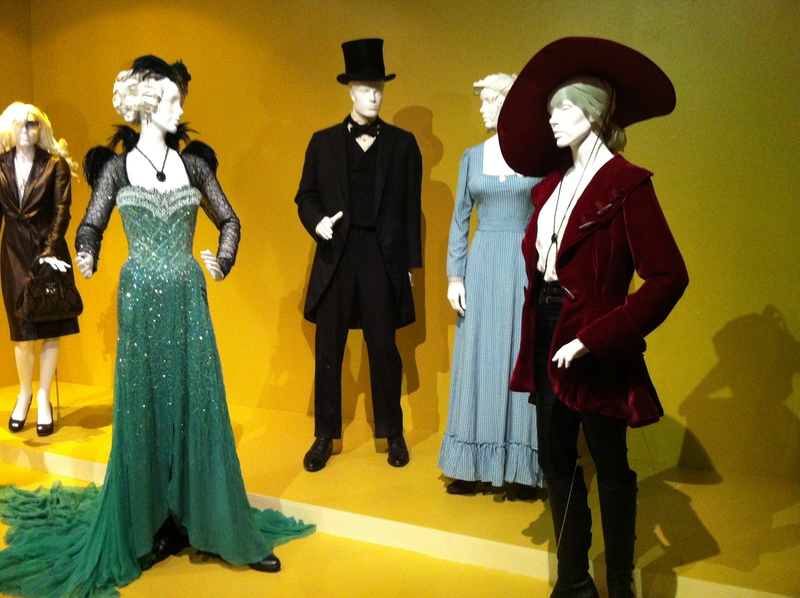 The exhibit is rounded out by costumes from many different period pieces, including Daniel Orlandi’s designs from Saving Mr. Banks, which involve both the warm tweeds on Emma Thompson’s character and the darker-toned, beautifully beaded turn-of-the-century ensemble worn by Rachel Griffiths. 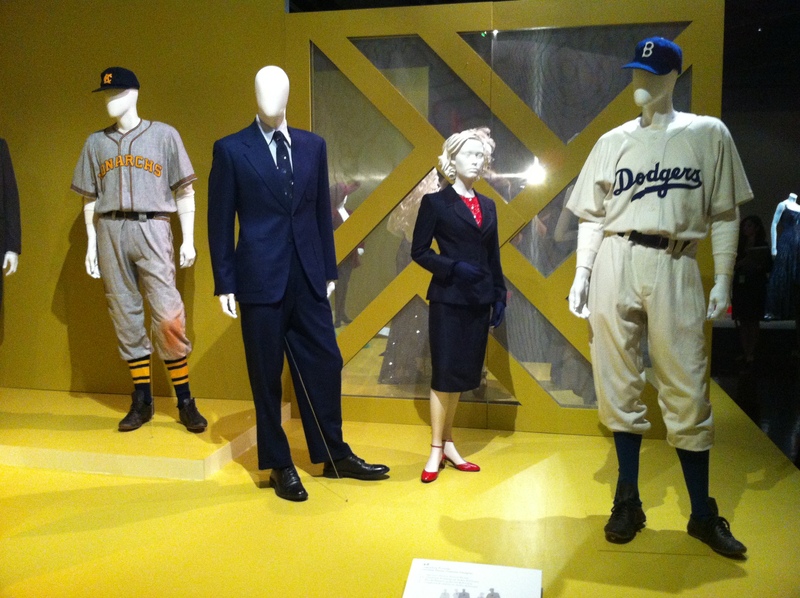 Designer Caroline Harris’ costumes for 42 featured intricate detailing on the women’s and men’s suits, plus the great historical accuracy of the heavier 1940s baseball uniforms. 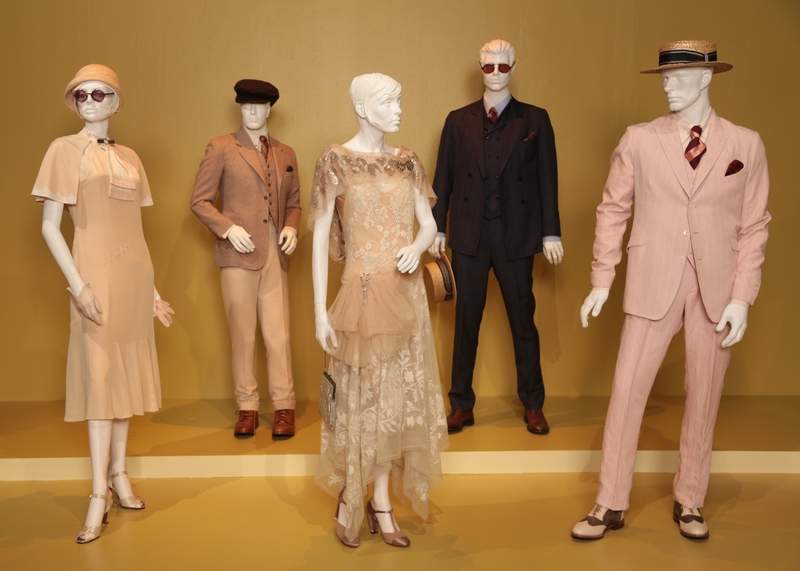 The Invisible Woman (designed by Oscar nominee Michael O’Connor) featured traditional and beautiful 19th-century gowns and suits, while fellow nominee Catherine Martin used a mix of 1920s fashion with current designer elements for The Great Gatsby. I also loved getting a close look at Gary Jones’ work for Oz the Great & Powerful, with its fanciful, bright colors and exquisite beading. Once again, the FIDM Museum has put together an impressive sample of the best in costume design for the past year. It is always so wonderful to see designers get recognition for the incredible, and sometimes unnoticed, effort they put into helping tell these stories. 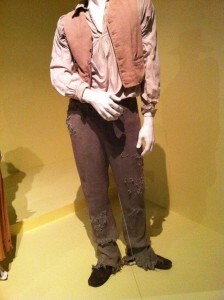 Kevin Jones summed it up very well: “one of the reasons why we like to do this [is] because not only are we teaching the next generation of designers…but the fact that there’s so much that’s put into the costumes solely for the character, for the actor…” and there are “hidden design aspects to so many of the costumes.” Audiences don’t always realize the importance of costume design, not just for the look of a film, but in the way they help actors get into character. With this exhibit, the public can see part of that process, as well as the extraordinary skill and innovation that goes into creating each piece. It is a wonderful show, and if you are in the Los Angeles area, I hope you get the chance to visit. It opened this week, and runs through April 26, 2014, on the campus of FIDM/Fashion Institute of Design & Merchandising, 919 S. Grand Ave., Los Angeles, CA 90015. Visitors’ hours are Tuesday through Saturday, 10 a.m. – 5 p.m. Admission is free. 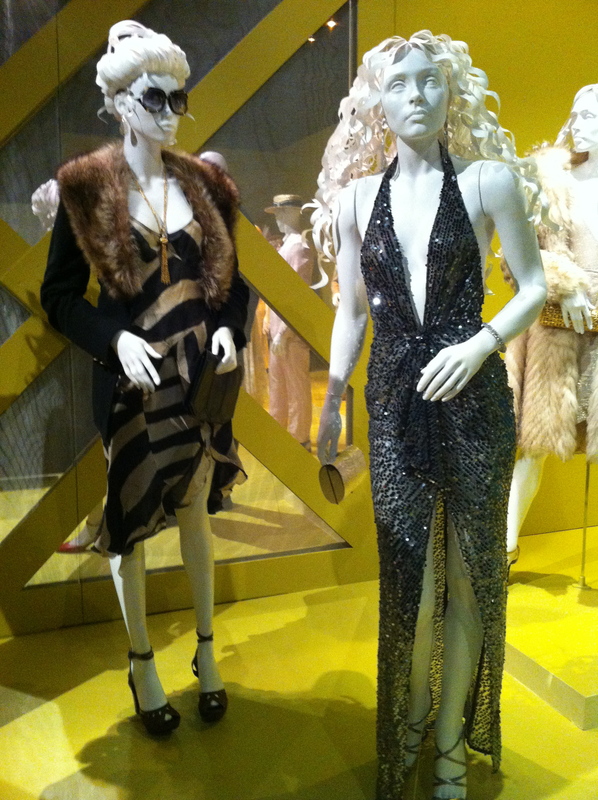 For more information, visit the FIDM Museum website.